Anupama and I finally made it out to Eden Center and Loving Hut in Falls Church this weekend. For those of you who aren’t familiar, Eden Center is a Vietnamese shopping plaza with dozens of restaurants, bakeries, and grocery stores, where you can stock up on fresh noodles and fried tofu while sipping on buzz-inducing iced coffee. And Loving Hut is an adorable vegan restaurant chain (I mean, just look at their logo) that has mastered the whole vegetable protein thing. 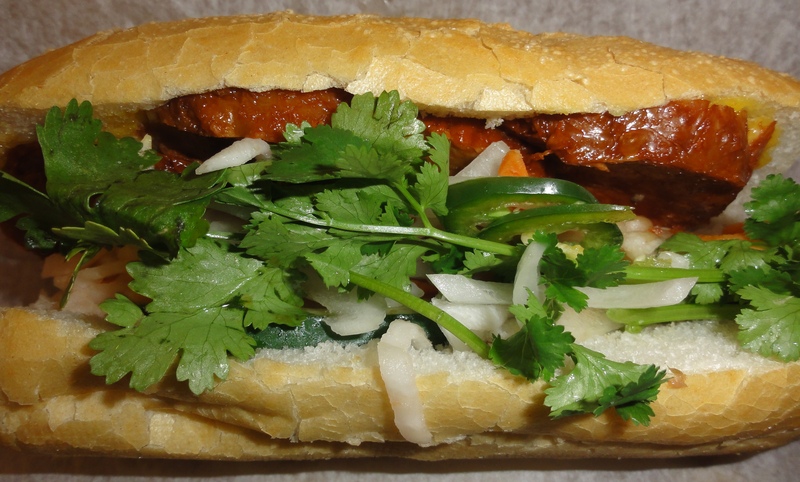 Shopping for groceries at Eden Center was quickly sidelined in favor of sharing a vegetarian banh mi at Song Que Deli. For $3.75, you get a slice of baguette filled with caramelized tofu rounds, cilantro, gently pickled shredded carrots and daikon radish, onion, and jalapeno. The caramelized tofu was really smooth and pleasantly chewy with a nice flaky skin, the bread was crusty and fresh, and the vegetables and herbs added spice and zip. We spent some time perusing different flavors of fried tofu, fat fresh udon noodles, mangos, and coconutty desserts before deciding it was time to eat again. Anupama bravely navigated us out of the parking lot (it’s kind of a free-for-all) and we headed to Loving Hut. Loving Hut has a couple of shelves of groceries too, including MSG-free vegetarian mushroom sauce (good for brown sauce in stir-fries) and mushroom seasoning (good to toss with vermicelli for rice paper rolls). We chose wonton noodle soup after reading about it in the Post, along with golden vermicelli with lemongrass protein and mixed vegetables and tofu. 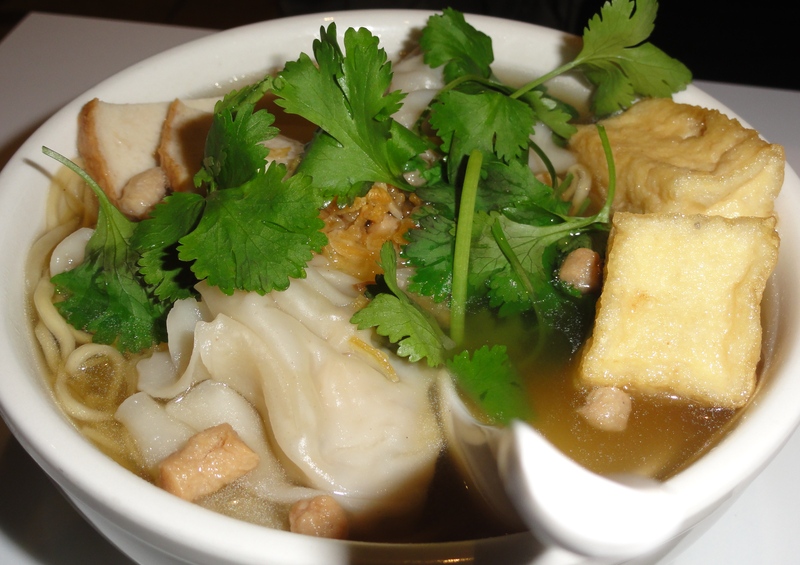 The soup was a protein party: small chewy nuggets, strips of tofu ham, fried tofu cubes, and dumplings filled with mushrooms and shredded soy protein, all swimming in a rich and flavorful broth with noodles. We did wish for more vegetables (there wasn’t much Chinese broccoli or anything else to speak of) so we’ll request extra next time. 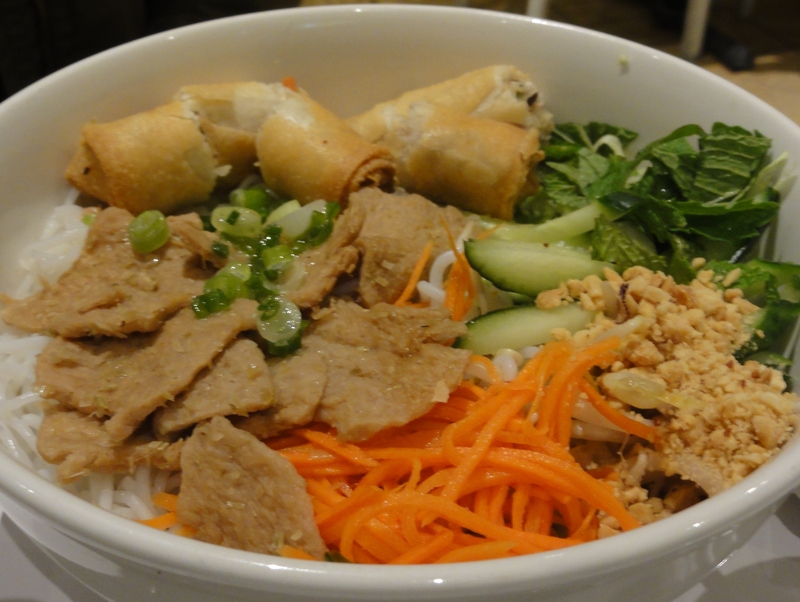 The golden vermicelli was more like a salad than a typical noodle bowl, with chopped fried spring rolls, soy protein, carrots, cucumbers, mint, and peanuts sitting on a bed of room-temperature rice noodles. The soy, marinated and flecked with tiny bits of lemongrass, was out of this world. Toss everything together with the homemade slightly sweet, slightly sour sauce and enjoy. Plenty of other items will fulfill more traditional stir-fry cravings. 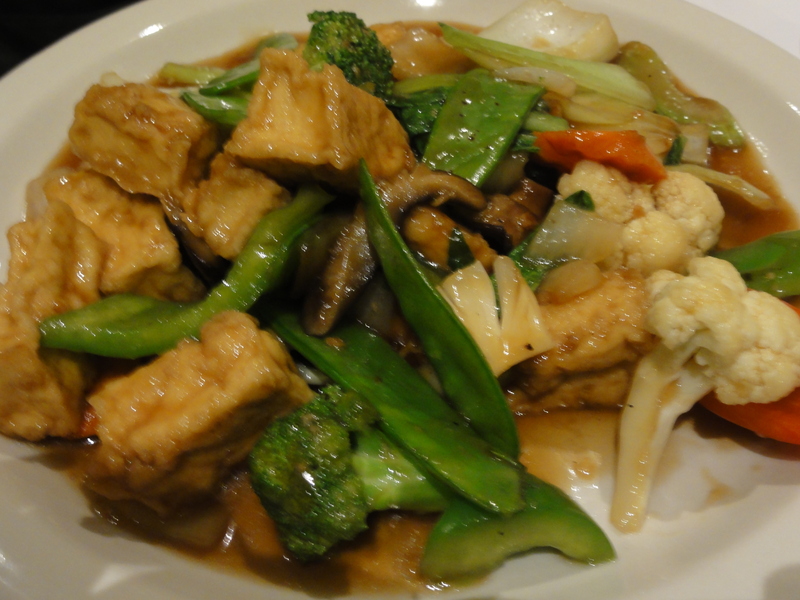 We eyed the sesame eggplant tofu and lemongrass tofu with mixed vegetables before settling on a classic dish of tofu and mixed vegetables in brown sauce. We were glad to have something with a substantial vegetable component and it was solid, but nothing to write home about. Next time I’m going lemongrass all the way. We left satisfied, stuffed, and carrying leftovers for the next day. With generous portions, high quality ingredients, and most entrees between $6-8, I guess it’s wishful thinking to expect Loving Hut to open a branch in the district any time soon. A vegetarian friend highly recommended Tandoori Nights in Clarendon, so when a Google Offer came up for it, I jumped on it. 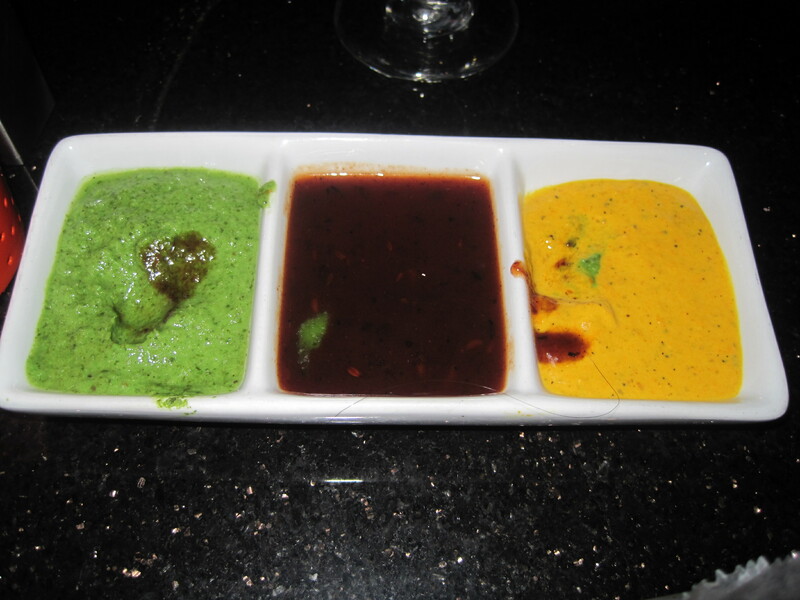 In all the years I’d lived in DC, I had found only two DC restaurants where it seemed worth eating Indian food outside of my house – Bombay Club and Rasika (reviews coming soon), and I was curious to try Tandoori Nights. The decor is lovely and and my hopes for the meal rose when our server brought out appadams with three different tasty chutneys to start us off. Yes, we’d already dug in by the time I took the picture. 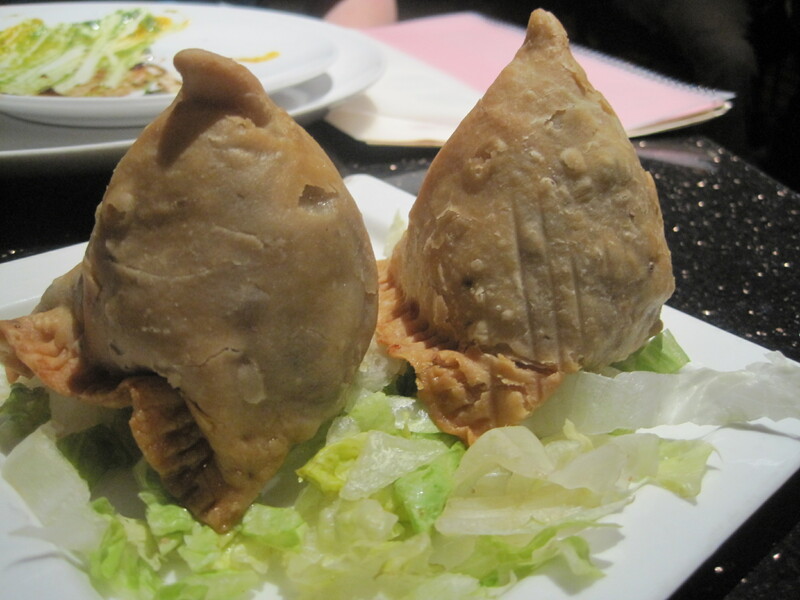 Our samosa appetizer (just your standard potatoes and peas samosa) was solid and seemed to be freshly made. Sadly, it all went downhill from there. 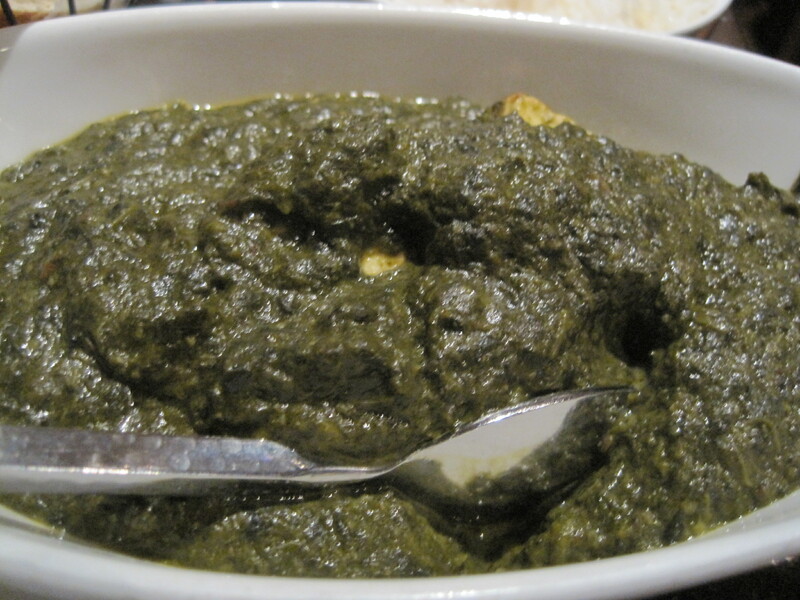 I remembered reading a friend’s reviews of Seattle-area Indian restaurants, and how he used palak paneer as his control dish – he tried that everywhere for consistency. I decided to do the same and ordered that. Eric opted for paneer tikka masala. 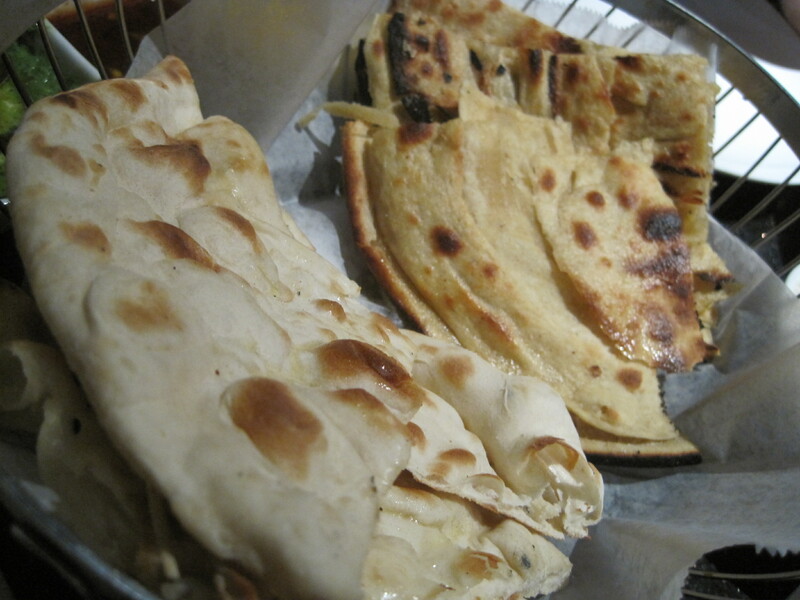 We also sprung for some plain naan and a laccha paratha (multi-layered whole wheat flat bread). So…the breads were fine. 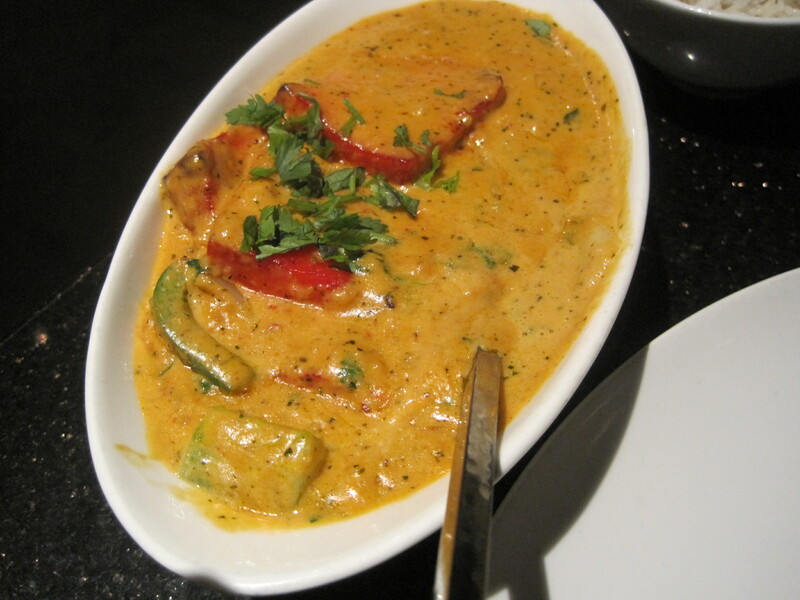 But the curries were, I’m sorry to say, tasteless. At least the paneer tikka masala had a good color (those red pieces are the paneer) and a bit more flavor, much improved by a liberal sprinkling of salt. Needless to say, I’d skip Tandoori Nights. 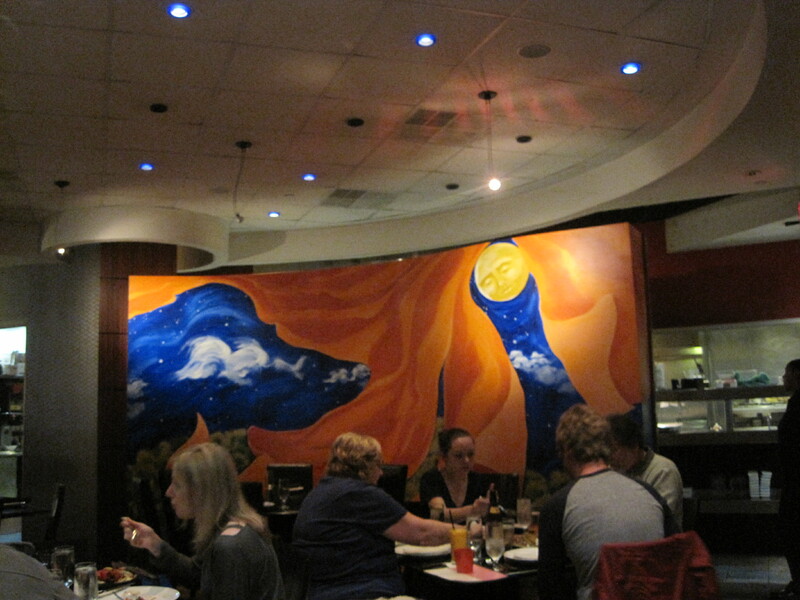 It might be a while before I try another new Indian place, but for now I think I’ll see about a reservation at Rasika. 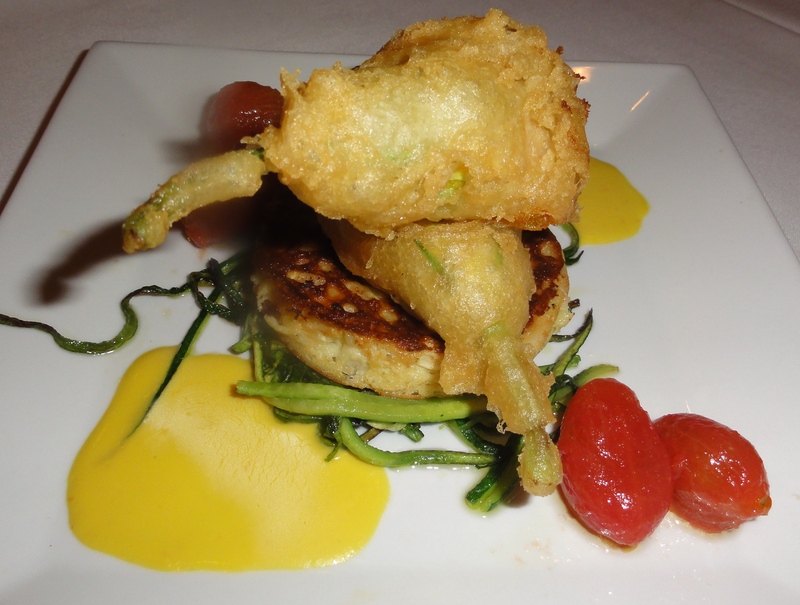 We had yet another fantastic Restaurant Week meal at Willow in Arlington on Thursday. It was my first visit (Anupama’s been twice before) and I had been dreaming about the description of the vegetarian entree since looking at the menu a few weeks ago. We were greeted by a jovial server whose good cheer lasted throughout the meal despite the Restaurant Week rush. Skipping the sad dry bread at the table (which turned out to be a wise appetite-saving measure), we hit the menu to make our only tough decision: two diners, three vegetarian appetizers. 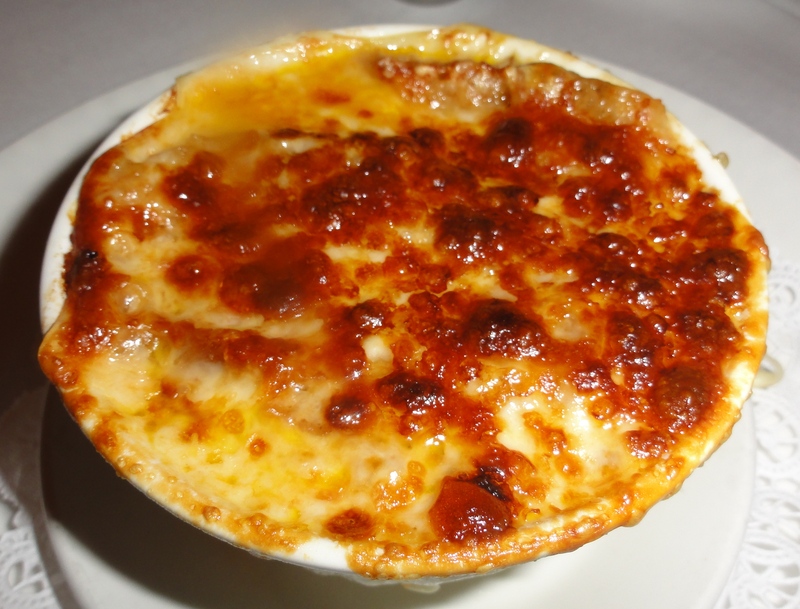 We settled on a summer vegetable pistou gratin with pesto and gruyere and a tomato, almond and basil gazpacho, but not without some regret for having to exclude summer corn chowder. Note: Because Willow clearly marks all of its items as V for vegetarian and GF for gluten-free, there was no risk of ordering often sneakily non-veggie items like soups and risotto. If only more restaurants would do this, things would be much simpler for diners with dietary restrictions. Once we dug below the gruyere, we found bright, tender-crisp carrots and beans in a basil pesto broth and chunks of soaked through bread. The combination was pleasing and gave us the idea of adding a little pesto to clear summer soups. 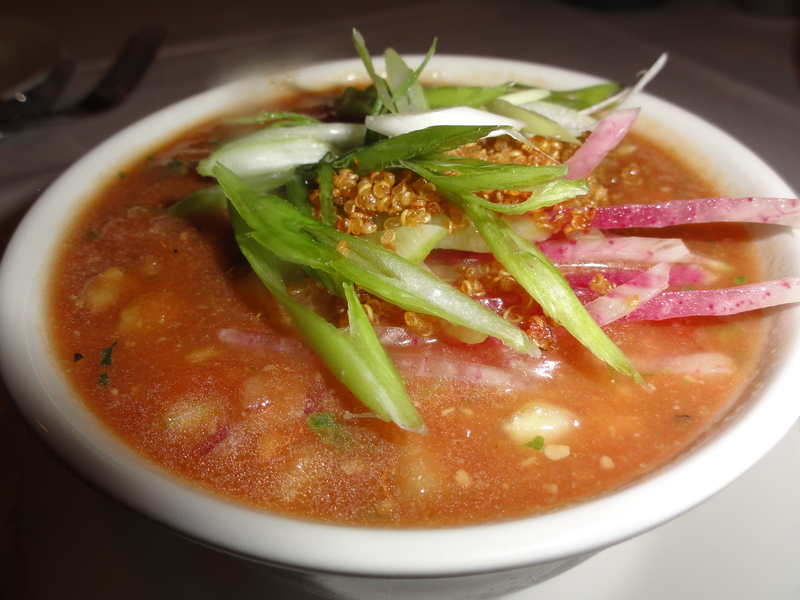 The gazpacho was even more inspirational, with bites of sweet almond mixed in with tiny chunks of tomato, cucumber, radish and celery in a flavorful tomato puree, topped with avocado cream and crispy quinoa. The combination of flavors and textures really set this gazpacho apart from the many other versions we’ve tried, and we’re definitely going to give it a shot at home. The much-anticipated entree held up to our expectations. The squash blossoms were nice – crispy, light, and filled with ricotta and red pepper zucchini ratatouille (there were those tiny chunks again!). However, the corn pancake hiding under the blossoms on a bed of julienned zucchini actually ended up stealing the show. It didn’t look like much, but the fluffy, savory pancake with browned edges and sweet corn kernels left us wanting a whole plate. This would be a great brunch item. In fact, Willow shares some of its recipes and we found this one online so we’ll be trying it out for brunch next weekend and letting you know how it goes! For dessert we chose the layer cake of the day, which was banana with white chocolate buttercream, and tiramisu pie. The pie was a bit disappointing, but boy does Willow know layer cake. 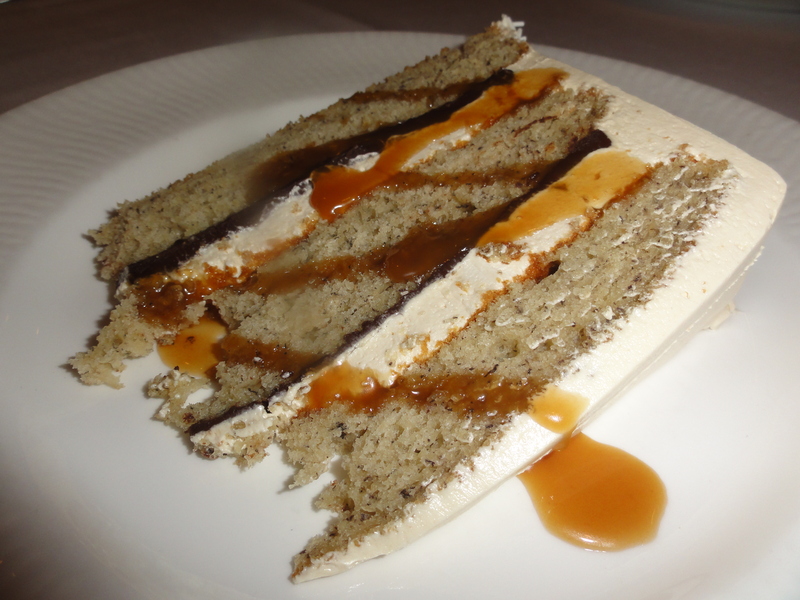 The banana cake was fluffy and moist, the buttercream was light-as-air and not too sweet, and just the right amount of rich chocolate ganache and caramel drizzle was added to round things out. We’ll definitely keep Willow at the top of our Restaurant Week list, but we’ll likely head back sooner. Their emphasis on local seasonal ingredients means that the menu changes often to feature vegetables at the peak of their flavor, and we’re eager to see what Willow has in store for Fall!